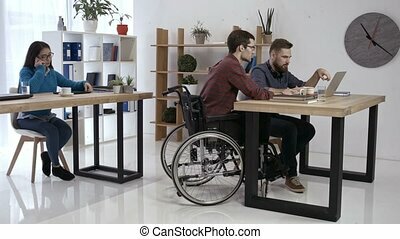 Young business people in the office working together. Business people in the workplace. 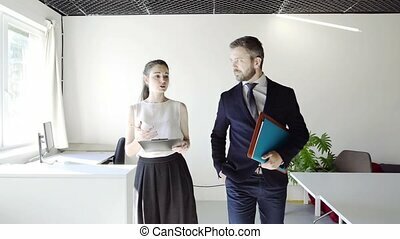 Beautiful mature woman and man in the office, working together. Business people in the workplace. 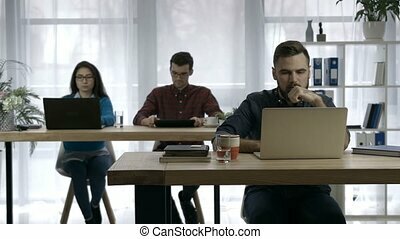 Two women and two men sitting in the office working together. Business people in the workplace. 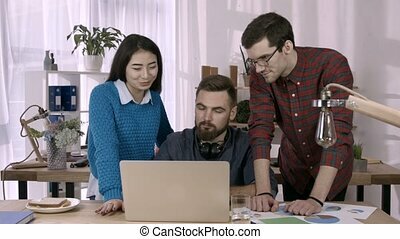 Two women and man sitting in the office working together. Two attractive young business people in the office working together. Business people in the workplace. 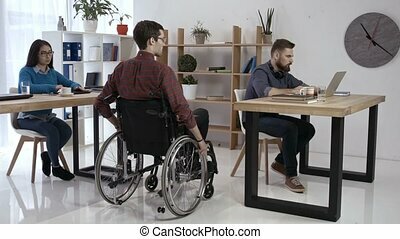 Beautiful mature woman and man sitting in the office, working together. 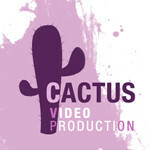 Successful entrepreneurs and business people achieving goals. Young diverse business team in casual outfits celebrating success together at workplace in office and giving high-five. Dolly shot. Friendly business team working on their project together at office using laptop. Group of diverse entrepreneurs working on computer and discussing market research, sharing ideas in modern office. Place where ideas are born. Young professionals working and communicating together in creative office. Successful business team working with digital devices and generating ideas in office. Time lapse. 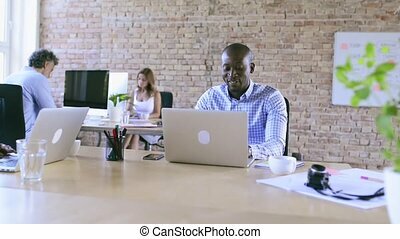 Freelance business team with laptop having video conference via internet with foreign business partners in modern office. Cheerful diverse business colleagues chatting with entrepreneur via skype. Attractive asian girl working with documents and laptop in open space office with coworkers using digital devices on background. Young female freelancer drinking healthy berry smoothie at workplace. Stressed hipster man with beard working on laptop at desk in busy creative office and crumpling paper. 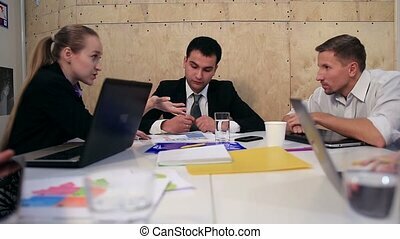 Exhausted businessman under stress due to excessive work while colleagues working on background. Busy young people talking and planning future work in open space office using laptop. 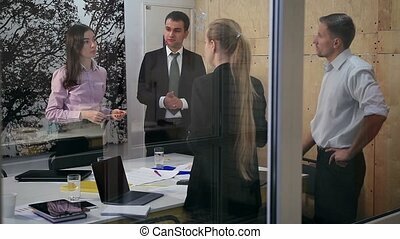 Confident diverse business colleagues brainstorming and working together on new startup project in office. Dolly. Group of diverse cheerful coworkers taking self portrait and making funny gestures in open space office. 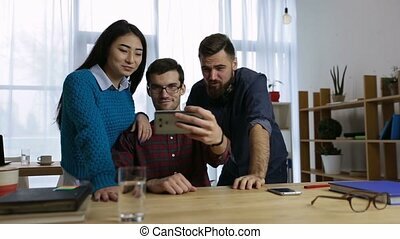 Smiling hipster colleagues in casual outfits making selfie on smartphone at workplace. Dolly. Casual diverse business team taking self-portrait with smart phone in startup office. Smiling business people making funny facial expressions while taking selfie on mobile phone in office. Dolly. 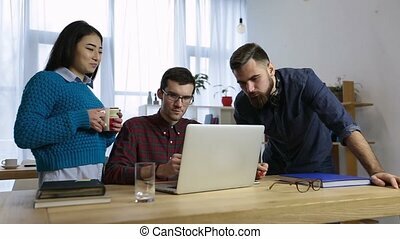 Young creative hipsters brainstorming on meeting at office and using laptop to note ideas. 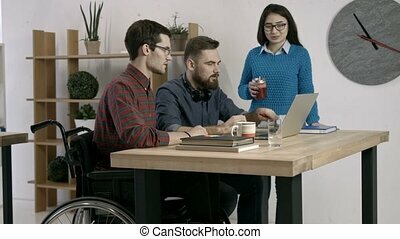 Disabled office worker in wheelchair and diverse colleagues discussing startup business in modern office. 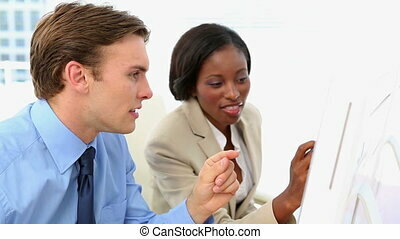 Attractive businesswoman in formalwear holding touchpad and showing new project to her male coworker. 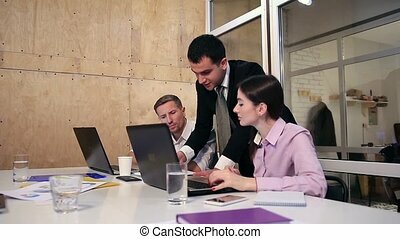 Business people working with digital tablet together in modern office. Office with white collar workers working on computers. 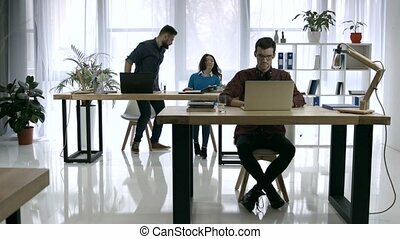 Young people working in busy creative office. 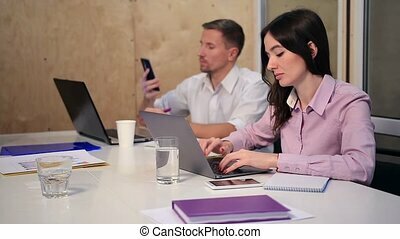 Confident beautiful business woman typing on laptop while her handsome colleague talking on mobile phone. Young successful manager in formal suit giving tasks and explaining agenda to business team at the office. Handsome businessman sharing ideas with his colleagues. Coworkers listening carefully to their team leader with understanding. 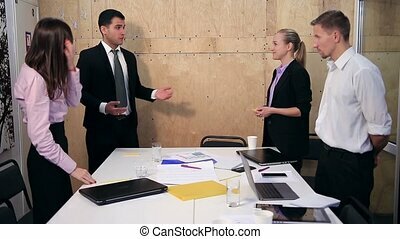 Professional businesspeople having business negotiation with international partners in conference room. Business partners gathered around the table to introduce company to foreign colleagues during negotiation. Shot through office window. Business partners meeting in the negotiation room. 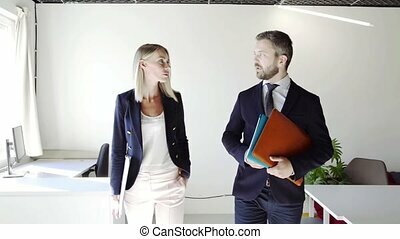 Business colleagues greeting each other with handshake and smiling before starting to discuss a new big deal agreement in modern office interior. Happy group of business people celebrating successful project in office. Team leader congratulating his colleagues with success. 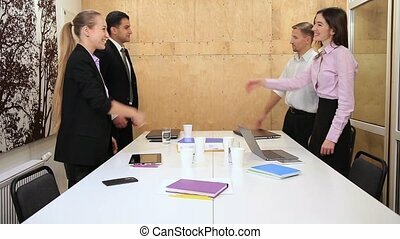 Excited business team giving high fives gesture to each other in the conference room. 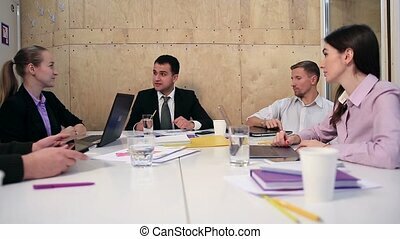 Business people gathered around table to discuss new strategy and project. 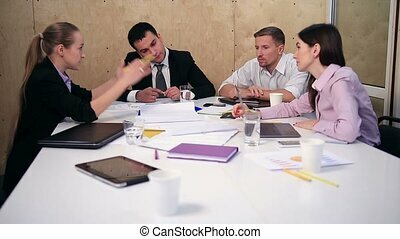 Team of business people having discussion at the table in office. 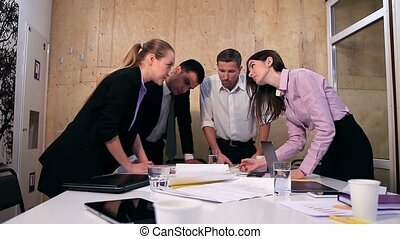 Group of creative coworkers communicating during a meeting and studying blueprints together. Group of corporate people having a business meeting at the office with boss sitting in the middle. 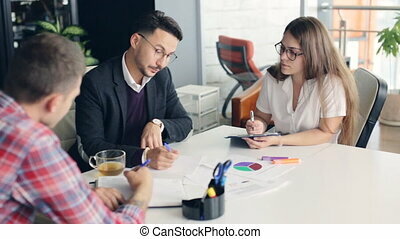 Young happy executive communicating with his employees during business catch up. Business partners exchanging business cards at the meeting in the office. Professional business colleagues introducing themselves to each other and giving visiting cards during the first round of negotiation between two global corporations. Serious dedicated young business people standing grouped together around the table studying project papers during the meeting at office. Successful business team discussing new project and gesturing while leaning to the table. Successful business team of four sitting in the office and planning work process. Business team seriously working on printed project sheets. 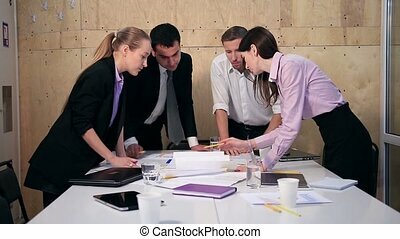 Attractive businesswoman explaining advantages of new business project to her colleagues. 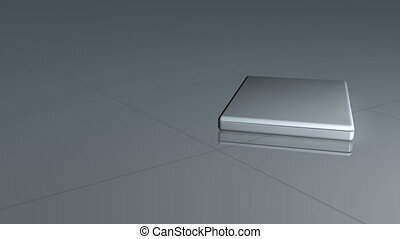 Five young business people discussing new project using laptop and touchpad to note ideas during the meeting at office. 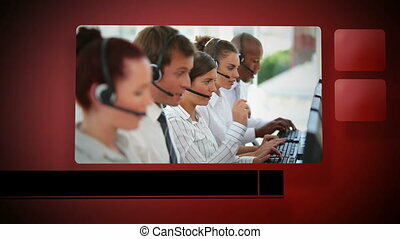 Young beautiful woman gesturing and discussing while her coworkers listening to her sitting at the office table. 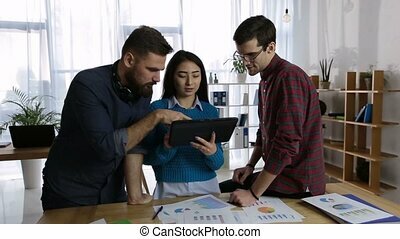 Beautiful businesswoman showing statistical data to her employees and pointing important details with hand using digital tablet in office. 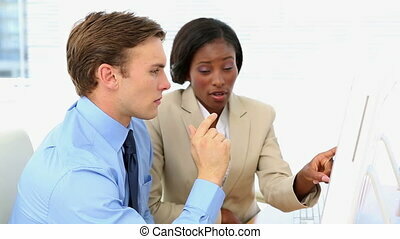 Female executive discussing financial results of the company with business colleague with the help of touchpad. Two business colleagues standing in front of flipchart with marker in hands and giving presentation at the office. 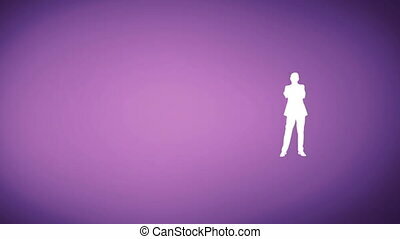 Businesswoman pointing at diagram with market share on board. Bussinessteam making a speech to foreign clients in the meeting room. Close-up of diverse hands with pencils discussing and working on blueprint of new apartments at office. 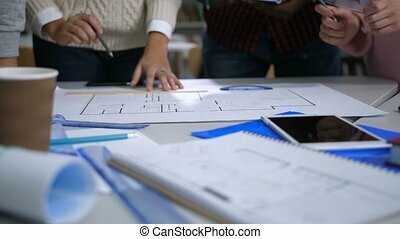 Multinational team of interior designers with sketch plan sharing ideas for project improvement.